The Lesser Prairie Chicken (Tympanuchus pallidicinctus) (“LPC”), is a member of the grouse family and can be found in multiple ecosystems across its five state range of Kansas, Oklahoma, Texas, Colorado and New Mexico. Once numbering in the hundreds of thousands across nearly one hundred million acres, as of July 2017 there are only estimated to be approximately 33,000 birds left. These few remaining Lesser Prairie Chickens are spread across a now disconnected landscape that covers approximately nineteen million acres. 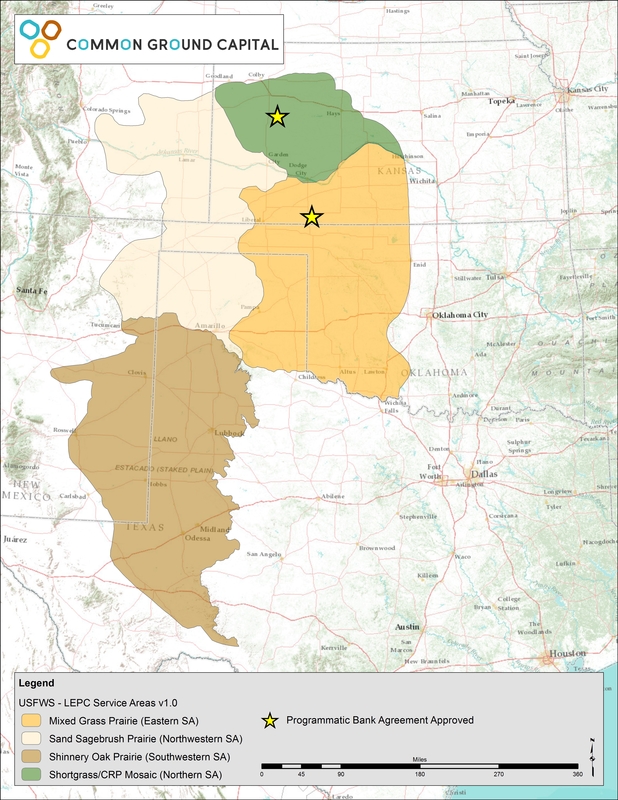 The United States Fish & Wildlife Service (“USFWS”) announced its decision to list the LPC as Threatened under the Endangered Species Act in March 2014. The LPC’s remaining habitat and population is vulnerable due to the next wave of development threats which are now occurring and targeted for its remaining habitat. Threats identified by the USFWS include destruction of habitat through grassland conversion to agricultural crops and numerous impacts from the next generation of both traditional and renewable energy development and associated supporting infrastructure. On September 2, 2015, Judge Robert Junell took an unprecedented step to strip federal protections from the Lesser Prairie Chicken across its range. The ruling by of the U.S. District Court for the Western District of Texas overturned the USFWS decision in spring 2014 to list the lesser prairie chicken as threatened in Texas, New Mexico, Oklahoma, Kansas and Colorado, where the bird’s native grassland and prairie habitat had shrunk by 84 percent. Junell ruled that FWS failed to consider the extent to which a rangewide conservation plan crafted and administered by state wildlife agencies and supported by energy companies and landowners prior to the listing decision in March of 2014 would ameliorate the chicken’s top threats — including oil and gas wells, renewable energy development, grazing, woody species brush and tree encroachment, and conversion of rangeland to crops. Legal experts said it’s quite rare for a federal court to overturn a FWS listing decision. The USFWS has been working on the species status assessment for the Lesser Prairie Chicken since the Fall of 2016 after concluding that the species may indeed warrant re-instating protection under the ESA. It is believed to be completed and to be released sometime in the June-September 2018 time frame. The vision for creating a portfolio of conservation banks across the range of the Lesser Prairie Chicken was conceived way back in 2008, but due to competing priorities at the time and lack of a potential market from a policy perspective, the plan was shelved until 2011. In April of 2012 the execution phase of the business plan began in earnest and the Common Ground Capital/LPC Conservation Team has executed on the majority of its major objectives over the past six years. 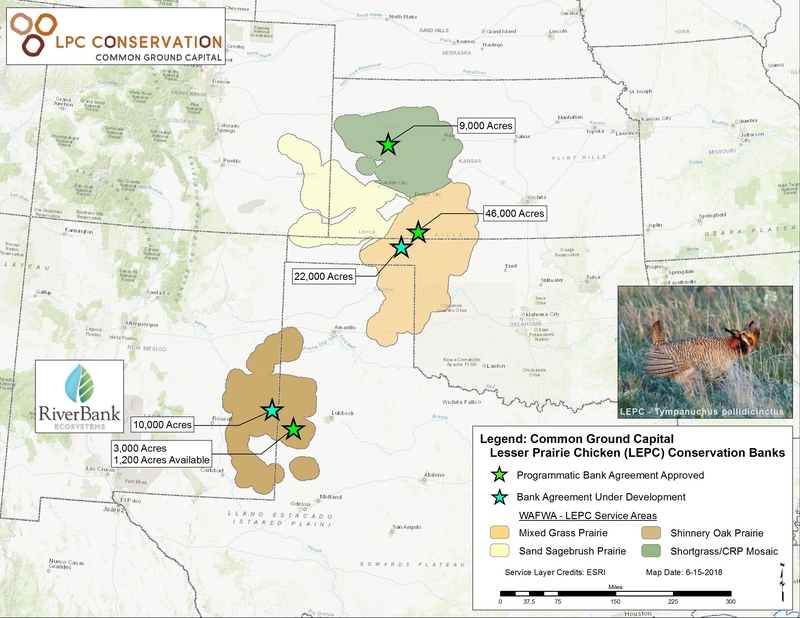 Through diligent efforts, Common Ground Capital (“CGC”) has worked with a limited and amazing group of private landowners to secure acreage and now fully approved conservation banks in three out of four ecosystems across the range of the Lesser Prairie Chicken. CGC has also been involved and continues to work with WAFWA, the alternative Oil & Gas Industry HCP/HCEX plan, wind energy HCP, its own proposed Renewable & Transmission Industry CCAA and individual companies as potential purchasers of its conservation banking credits. As far as CGC knows, our conservation banks are the only approved mitigation option by the USFWS that has a high degree of certainty to withstand any potential legal challenges at this time. What is an incidental take permit vehicle? Well if you are new to the world of endangered species and you don’t know the answer to this question, you should go find an endangered species attorney or consultant quickly. Your way of doing business may change in a big way. The short answer is that in order to impact an endangered species or its habitat you must acquire an incidental take permit (“ITP”) through either Section 10 or 7 of the Endangered Species Act (“ESA”), typically through a habitat conservation plan (“HCP”). For “take” that occurs prior to the effective date of the listing decision (May 2104) industry may pursue a candidate conservation agreement with assurances (“CCAA”), not to be confused with CCAA’s that private landowners may utilize. In rare situations, the USFWS will allow take through an approved conservation plan through Section 4(d) of the ESA. This option is available for the Lesser Prairie Chicken by way of the WAFWA Range Wide Plan. Up until 2016 the WAFWA RWP was the only means to offset “take” for industry parties. Currently, WAFWA can provide coverage for the oil & gas industry only through that industry’s CCAA. Other parties are working on industry wide permit vehicles, but they are not yet available. Common Ground Capital should have an industry wide CCAA available to address wind, transmission and solar impacts later this year. Bottom line, whatever permit take vehicle you choose, Common Ground Capital’s conservation bank credits should be considered as your solution for mitigation credits. Conservation bank credits can be used for different take vehicles and allow industry parties to control credit supply thus protecting your mitigation investment and your ability to have credits when you need them to get your project completed.